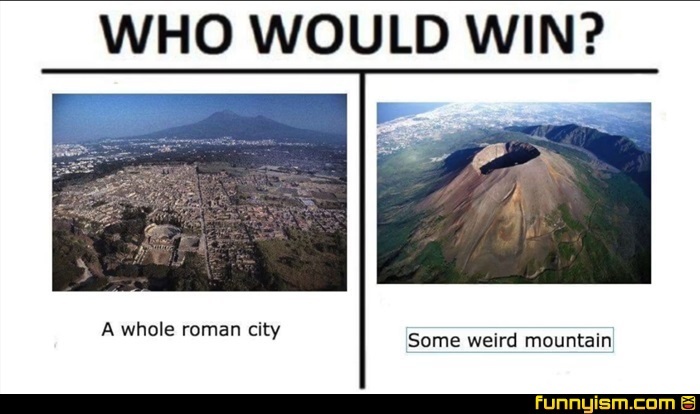 A Roman City or One Smokey Boi? Man mountain, you are so weird. Woah mountain don't blow this out of proportion, you don't have to explode, you look like smoke is gonna come out of your ears. Recent studies of the victims of Vesuvius suggest that the pyroclastic flow was so hot that the fluids in peoples bodies vaporized and caused their heads to literally pop. Obviously temperatures this high killed them before the head explosion but, regardless....its mind blowing right? I’ll let myself out.